1) The month of March is for celebrating and honoring the "fearless females" in our families. See Lisa Alzo's list of prompts for this year at http://www.theaccidentalgenealogist.com/2015/02/back-for-sixth-year-fearless-females.html . 2) The prompt for today is: "March 7 — Share a favorite recipe from your mother or grandmother’s kitchen. Why is this dish your favorite? If you don’t have one that’s been passed down, describe a favorite holiday or other meal you shared with your family." If that prompt doesn't work for you, select another one from the list. 3) Share your "Fearless Female" story on your own blog, in a comment on this blog post, or in a post on Facebook or Google+. Be sure to link back to your post in a comment on this blog post. 1) My mother, Betty Virginia (Carringer) Seaver (1919-2002) worked outside the home as an unmarried woman and early in her marriage before children arrived. She graduated from San Diego State College in June 1940 with a Bachelor of Science degree in Art. Starting in the fall of 1940, she taught Art and English at Woodrow Wilson Junior High School in San Diego for at least two years, perhaps three. After she married my father in July 1942, she worked at Rohr Aircraft Company as a secretary to the Chief of Engineering. Then I came along in October 1943. My father went in the U.S. Navy in August 1944 and I think my mother went back to teaching in September 1944 at Memorial Junior High School in San Diego. She was living with her parents at the time, and they supervised little Randy's life. After World War II ended, my brother Stanley came along in September 1946 and she had her hands full with two small children, a husband looking for work, and an apartment to manage. After that, I don't think that she worked outside the home. 2) My maternal grandmother, Emily Kemp (Auble) Carringer (1899-1977), worked outside the home in the 1925-1940 time frame, at Marston's Department Store in downtown San Diego. She was a saleslady according to the San Diego City Directories. My grandfather worked at Marston's also. 3) My paternal grandmother, Alma Bessie (Richmond) Seaver, was the organist and occasional choir director at several churches in the Leominster, Massachusetts area in the 1920 to 1960 time period. I am in the 8th great-grandmothers and I'm up to Ancestor #1095 who is Mary WIGHT (1638-1693) [Note: the earlier great-grandmothers and 8th great-grandfathers have been covered in earlier posts]. 1094. Thomas Ellis, born before 13 December 1629 in Wrentham, Suffolk, England; died 12 December 1690 in Medfield, Norfolk, Massachusetts, United States. He married 21 May 1657 in Medfield, Norfolk, Massachusetts, United States. 1095. Mary Wight, born about 1638 in Dedham, Norfolk, Massachusetts, United States; died 07 March 1693 in Medfield, Norfolk, Massachusetts, United States. * Judith Ellis (1658-???? ), married 1678 Benjamin Rockett (1651-1747). * Mary Ellis (1660-1717), married 1678 Jonathan Adams (1655-1718). * Abiel Ellis (1662-1716), married 1683 Zechariah Barber (1656-1705). * Samuel Ellis (1664-1712), married 1695 Deborah Lovell (1675-1740). * Patience Ellis (1669-1695), married 1691 Henry Adams (1663-1749). * Joanna Ellis (1678-???? ), married 1698 Jonathan Rockett (1665-????). 2190. Thomas Wight, born about 1607 in England; died 17 March 1674 in Medfield, Norfolk, Massachusetts, United States. He married about 1627 in England. 2191. Alice LNU, born about 1608 in Isle of Wight, Hampshire, England; died 15 July 1665 in Medfield, Norfolk, Massachusetts, United States. * Thomas Wight (1629-1690), married 1661 Mehitable Cheney (1643-1693). * Anne Wight (1634-???? ), married 1655 Isaac Bullard (1630-1676). * Mary Wight (1638-1693), married 1657 Thomas Ellis (1629-1690). * Samuel Wight (1640-1716), married 1663 Hannah Albee (1640-1723). * Ephraim Wight (1646-1723), married Lydia Morse (1645-1722). * Henry Wight (1646-1680), married Jane Goodman. * William Ward Wight, A Record Of Thomas Wight Of Dedham And Medfield And Of His Descendants 1635-1890 (Milwaukee, Wis. : Swain & Tate?Printers, 1890). "One of the new lectures is "Ten Resources I Use Every Day." Top 10 lists seem to be a popular thing. I remember being asked on many occasions to create top 10 lists of sites to present in lectures at conferences. Thus, this lecture idea was born. I've been adding to an outline for a while now. It is all the things I do and all the things I use during the day that make me more efficient, organized, and a better researcher. I have a lot more than 10 of them. It's 55 so far. So, I organized them into 10 categories. Ha! What are your favorite 10 resources?" 1) Local genealogy society programs and seminars. Attending a genealogy society program three times a month (usually), plus several all-day seminars each year, keeps me in a learning rhythm. I learn visually, so seeing Powerpoint slides is necessary for me. In addition, societies have user groups, research help, etc. to augment learning opportunities. 2) Webinars. I try to watch webinars from Family Tree Webinars weekly (usually after the live presentation), and try to catch those of interest to me from the Southern California Genealogical Society (I'm a member, so can watch after the live presentation), the New England Historic Genealogical Society, MyHeritage, RootsMagic, and occasionally other websites and genealogical societies. 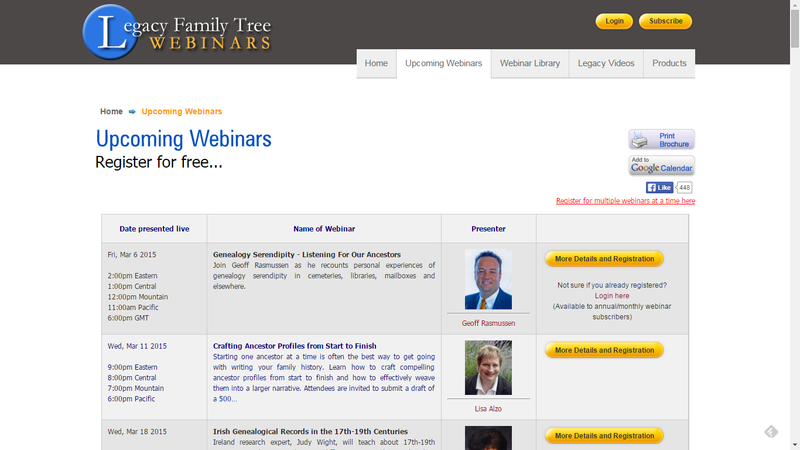 Find upcoming webinars at GeneaWebinars. 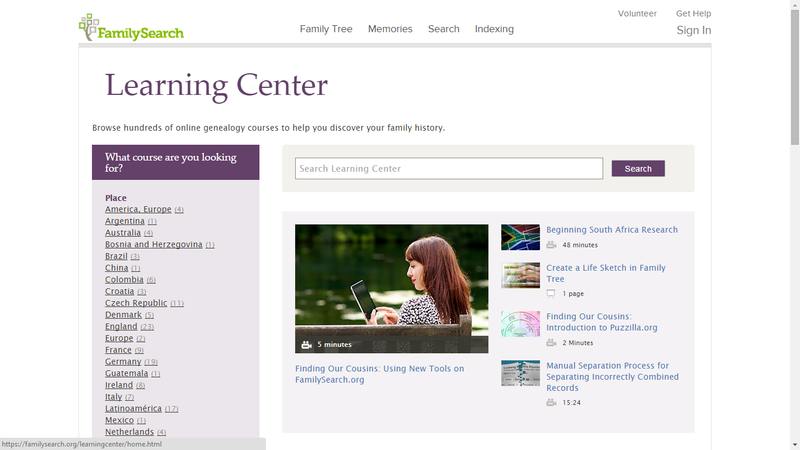 3) FamilySearch Learning Center Videos. There are over 500 videos, ranging from 5 minutes to over 60 minutes on a wealth of topics and in several languages. 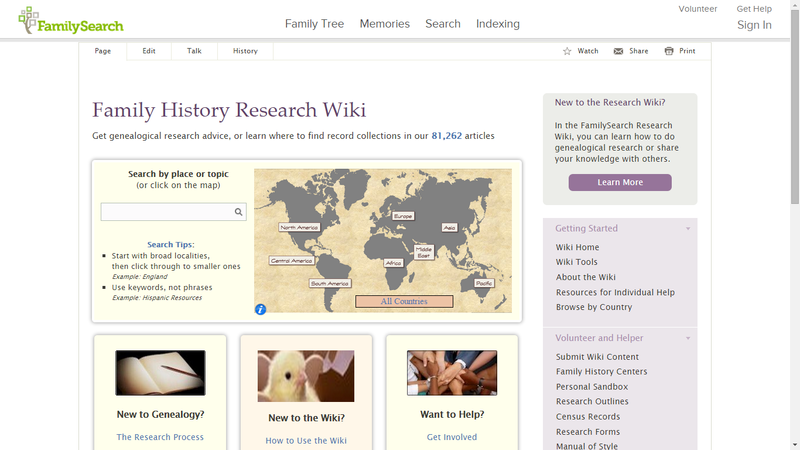 4) FamilySearch Wiki. There are over 80,000 articles on this site on most genealogy topics, including country, state and county resources. 5) Cyndi's List. 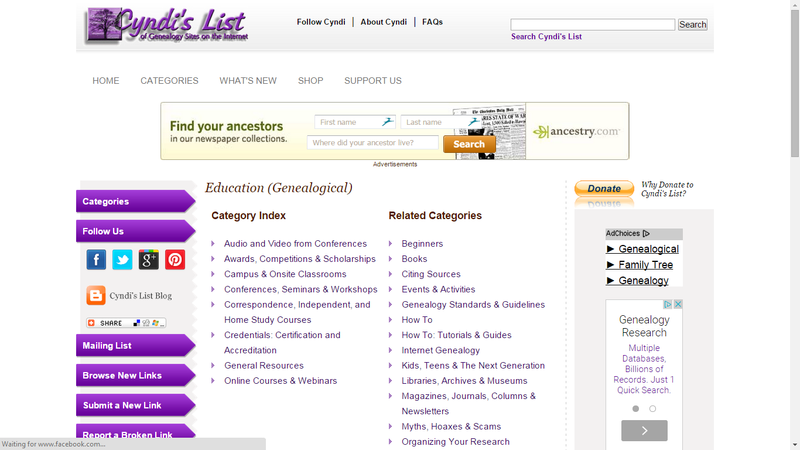 Cyndi Ingle has links to over 300,000 genealogy websites, arranged by category and sub-category. 6) YouTube. I have subscribed to over 20 YouTube Channels with genealogy content. Many genealogy websites, and quite a few individuals have a YouTube Channel where videos can be watched on a computer or mobile device. 7) Google+ Hangouts On Air. I participate in the Mondays With Myrt conversation on a regular basis, and occasionally on other Hangouts, as part of the panel that contributes to the broadcasts. Hangouts on Air are archived on YouTube. 8) Multi-day Regional and National Conferences, and Genealogy Cruises. I attend two or three of these each year, but I don't attend classes in every time slot (sometimes due to geneablogger duties or wandering the exhibit hall). I do appreciate the syllabus materials because they are a useful resource. 9) Radio Broadcasts and Podcasts. There are several radio shows focused on genealogy - Genealogy Gems, The Genealogy Guys, Fieldstone Common, Extreme Genes, Research at the National Archives, etc. I listen to these occasionally. 10) ProGen Study Group. I was in ProGen I and it was excellent, exposing me to resources and methodology for becoming a professional genealogist. Note that I did not include courses like Brigham Young University, Boston University Certificate in Genealogy Research, National Genealogical Society Online Courses, National Institute for Genealogical Studies, etc. or weeklong institutes like Institute of Genealogy and Historic Research, Salt Lake Institute of Genealogy, National Institute on Genealogical Research, Genealogical Research Institute of Pittsburgh, etc. I have not experienced them, but if I had they would very likely be near the top of my list! This is not a comprehensive list of educational opportunities, but my subjective list of education resources that I have used over the past 20 years. The Global Family Reunion has just launched a crowdfunding campaign with two not-so-minor goals: Unite the world and battle Alzheimer’s. The Global Family Reunion will take place June 6, 2015, and aims to be the biggest, most inclusive and most entertaining family reunion in history. Everyone is invited. It will include presentations by celebrities, genealogists, and famous scientists, music, comedy, games, interactive exhibits and food. The main event will be held on the grounds of the world’s fair in New York, but there will be simultaneous parties around the world. It’s also a benefit to raise money for Alzheimer’s disease. When you purchase any of the Global Family Reunion campaign perks on IndieGoGo, you can feel good knowing that all proceeds -- after covering the costs of the event -- go toward battling Alzheimer’s. The Alzheimer’s Association New York City and the Cure Alzheimer’s Fund are the official beneficiaries. The event’s founder, author A.J. Jacobs, watched his grandfather succumb to dementia, and this inspired A.J. to make the reunion about keeping family memories alive. Visit the campaign page to find out how you can contribute and get involved. --Signed copies of A.J.’s upcoming book about the quest to unite the world with DNA and family trees. --A.J. will even dedicate the book to the first person who donates $10,000 to the Alzheimer’s benefit. (His wife will understand). The Global Family Reunion believes that massive multi-national family trees serve their own great purpose. Scientists are studying the online mega-family trees to see how diseases and traits are passed from generation to generation. Genealogy has the potential to help us find many cures. The mega-trees – which now number in the millions – also spur students to become interested in history. If you’re related to Abe Lincoln, even if distantly, you’re more likely to want to learn about him. And the big hope is, once we see that all humans are, in fact, part of the same family, we'll treat each other with a little more kindness. As cousin John Lennon said, you may call us dreamers, but we're not the only ones. The Global Family Reunion’s partners include MyHeritage, Geni, FamilySearch, Findmypast, WikiTree, 23andMe, FamilyTree DNA and the Federation of Genealogical Societies. If you are interested in attending, please see the event website at globalfamilyreunion.com for more information. Plus, take a few minutes and watch Jacobs’ TED talk The world’s largest family reunion…we’re all invited . I know that I am a cousin to A.J. Jacobs - he told me so, and I have a picture to prove it!! Geni.com tells me that he is my "9th cousin once removed's husband's nephew." That's not exactly a cousin relationship - but it's an extended family relationship. All is well, however, because Geni.com tells me that I'm descended from King David (yes, THAT King David) - I'm his 91st great-grandson (see Cousins, Kinship, AJ Jacobs and King David - posted 12 September 2014). A.J. is the 114th great-grandson of King David according to Geni.com. I can't account for the disparity. If both of those descents are correct, then we are 92nd cousins 23 times removed. Unfortunately, the Global Family Reunion is scheduled for Saturday, June 6, 2015, right in the middle of the SCGS Genealogy Jamboree. So I won't be able to attend the Global Family Reunion, but I'll watch the videos (there will be videos, right?) after the event and watch my cousin unite the world for Alzheimer's Disease. I will make a contribution to a very worthy cause which has touched my family. Mercy Plimpton (1772-1850) is #69 on my Ahnentafel list, my 4th great-grandmother. She married in 1795 to #68 Aaron Smith (1765-1841). * their son #34 Alpheus B. Smith (1802-1840) who married #35 Elizabeth Dill (1791-1869), in 1826. * their daughter, #17 Lucretia Townsend Smith (1828-1884), who married #16 Isaac Seaver (1823-1901), in 1852. * their son, #8 Frank Walton Seaver (1852-1922), who married #9 Hattie Louise Hildreth (1847-1920) in 1874. * their son, #4 Frederick Walton Seaver (1876-1942), who married Alma Bessie Richmond (1882-1962) in 1900. 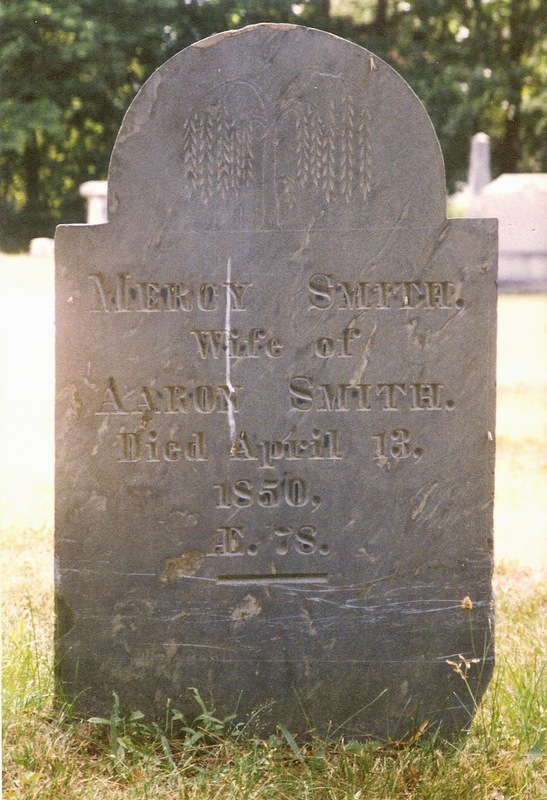 "Plimpton, Mercy, daughter of Amos and Mary, Sept. 9, 1772"
"Aaron Smith of Walpole and Mercy Plimpton, Oct. 6, 1795"
Aaron and Mercy Smith had eight children between 1795 and 1815, all registered in Medfield. One child died at age 18, but the other seven married and had children. 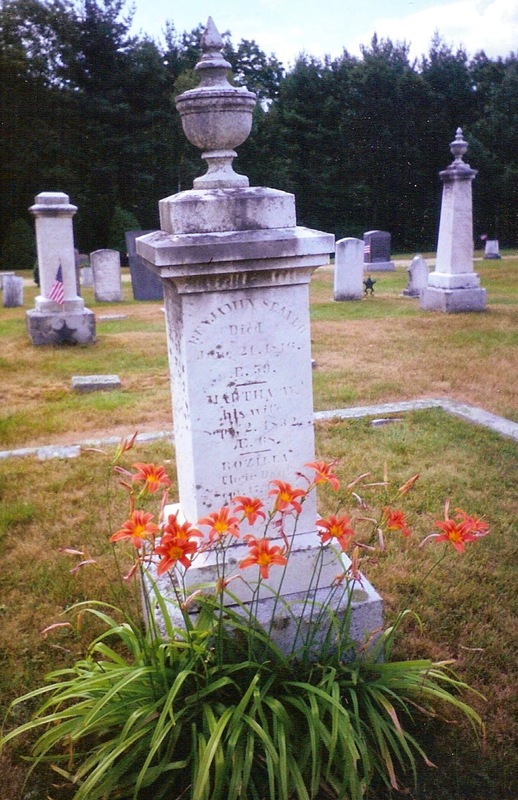 Mercy (Plimpton) Smith died 13 April 1850 in Medfield, Norfolk County, Massachusetts of "old age." She was listed as age 78 years, 7 months, 4 days. Her parents were given as Amos and Mary Plimpton. There are no probate records for Mercy Smith in the Norfolk County Probate records.
. Vital Records of Medfield, Massachusetts to the Year 1850 (Boston, Mass. : New England Historic Genealogical Society, 1903), Births, page 83, Mercy Plimpton entry.
. "Massachusetts Vital Records, 1841-1915," indexed database and digital images, New England Historic Genealogical Society, American Ancestors (http://www.AmericanAncestors.org), Volume 49, Page 123, Medfield, 1850, Mercy Smith entry.
. Jim Tipton, indexed database, Find A Grave (http://www.findagrave.com), Vine Lake Cemetery (Medfield, Mass. ), entry for Mercy Plimpton Smith (1772-1850).
. Vital Records of Medfield, Massachusetts to the Year 1850 (Boston, Mass. : New England Historic Genealogical Society, 1903), Marriages, page 171, Aaron Smith and Mercy Plimpton entry. I saw that the Ancestry.com mobile app updated when I turned on my iPhone today. There appear to be some new features, and I'm sure they will tell us what they are soon. Here's what I saw today in my brief sojourn into the app and my database. In the Family View, I saw six generations of ancestors, with siblings for the last four generations. I like having more generations, but some of the spouses of my direct line (on the screen above, my mother, my paternal grandmother) don't have there ancestors showing. If I tap on their image, then they do appear in a Family View. There are links for "View Hints" and "Search Records" under his name. The events are presented in a timeline format. At the bottom of the screen are buttons for "Timeline" (shown above), "Family" and "Gallery." 5) The information shown on the mobile app for the Timeline of a person includes almost all of the features that are included in the "LifeStory" in the Beta version of Ancestry.com that I highlighted about one month ago (see Ancestry Introduces Beta "Improved Website" - And A First Look). The information at RootsTech 2015 was that the Beta website would be available for all Ancestry subscribers in the late spring. Perhaps it will be accelerated now that the mobile app shows all of the LifeStory features. Note that the background for the three view options is the dark gray seen on the Ancestry Member Tree in the Beta version. I'm not a big fan of the dark gray color...but that's just me, I guess. I like the use of the light green on the mobile app screens to highlight the navigation tools and the event titles in the Timeline. I noted that the "Notes" for the person were included at the bottom of the Timeline screen on the mobile app. I still can't find them on the Beta site. I assume that they will be added to the person Profile, either at the bottom of the "LifeStory" page or on the "Facts" page. If I find other important additions to the Ancestry.com mobile app, I will highlight them. What have you found? I use the Ancestry Mobile app as my go-to "family tree in my pocket" app - as long as I have a cell or wifi signal, I can see pretty much what I have for a person in my Ancestry Member Tree. That eliminates a lot of paper that I used to carry with me in notebooks or my computer case. It's March again--and basketball fury's in the air. 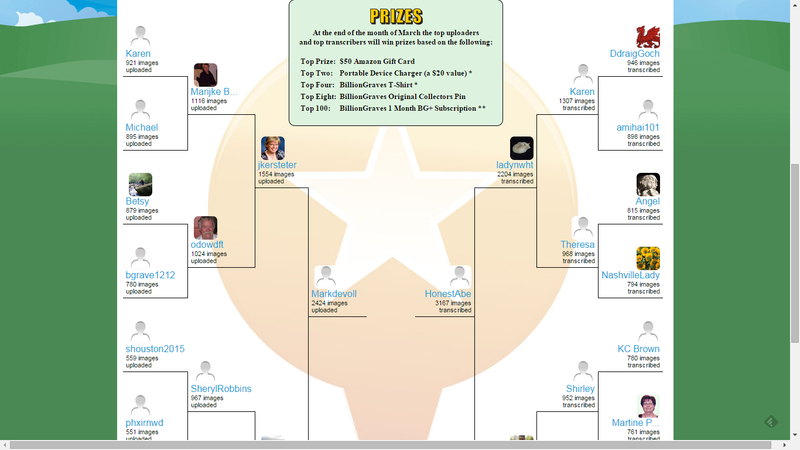 The NCAA's March Madness Tournament has begun! U.S. College basketball might not be for you, so we've decided to host our own BillionGraves competition! 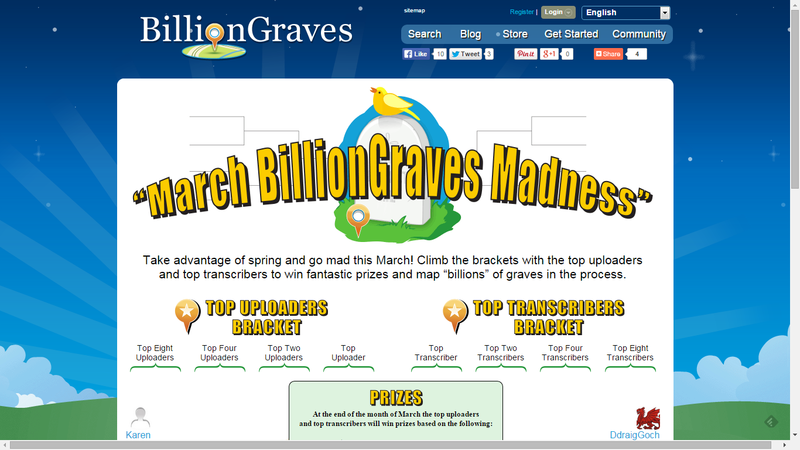 It's the "March 2015 BillionGraves Madness"! It can't be any better than doing your favorite thing- taking pictures of headstones and transcribing them, AND winning prizes! So take advantage of the rising temperatures to capture some headstone images at your local cemetery or get your transcribing game on. The more you do, the higher up on the bracket you'll be! You won't want to miss out on these awesome prizes! Do a weekly check of the BillionGraves blog or March BillionGraves Madness page to make sure at the end of the month you walk away with one of our awesome prizes! *For international winners, due to shipping restraints by shipping providers, a gift card worth the same USD monetary value to the prize you have won will be sent to your BillionGraves registered email within 4-6 weeks of the close the competition. **The 1 Month BG+ Subscription is in addition to those volunteers who upload more than 2500 photos and/or transcribe more than 500 records. This sounds like an interesting contest for those who can get out to some cemeteries, take a large number of photos with the BillionGraves mobile app, or can transcribe a large number of gravestones during March. Good luck! 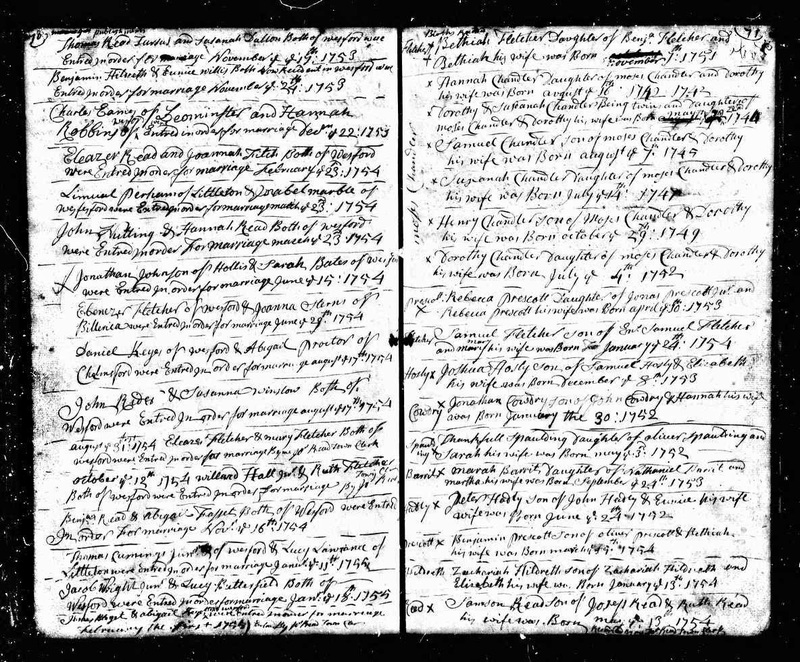 Massachusetts, Town and Vital Records, 1620-1988, digital images, Ancestry.com (http://www.ancestry.com : accessed 7 December 2012), "Westford Births, Marriages and Deaths, page 71 (penned, image 42 of 1750), Zachariah Hildreth birth entry, 1754. Zachariah Hildreth (1754-1820) is my fourth great-grandfather. He married (1) Elizabeth Keyes (1759-1793) and (2) Abigail Hart (1775-1846), and had 17 children with them.
" I am looking for information for an estate belonging to a Thomas Trent who passed away many years ago. He owned property on the 1000 block of Broadway in Chula Vista, we used to live directly behind him when I was a kid. He was already old and I would help him get around his house because he was so old. Anyway I remember one day my mother telling me an attorney came by asking questions about me because he wanted to add me to his will." Rick wanted to know if there was a will, and was he included in it. 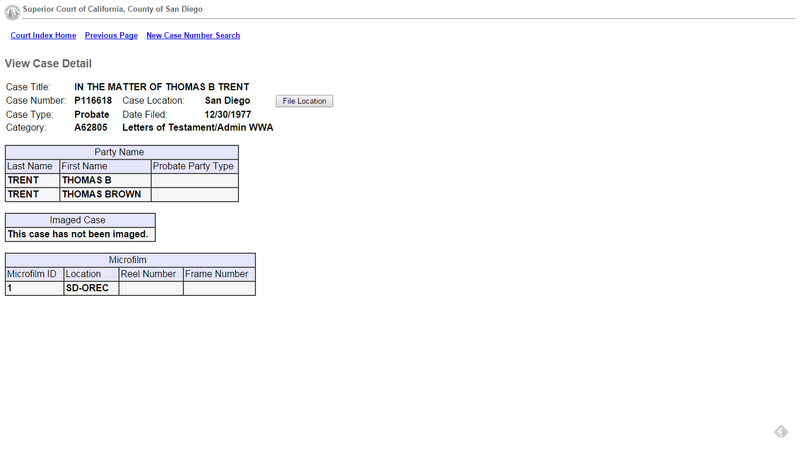 My first instinct was to determine when Thomas Trent died, presumably in San Diego County. 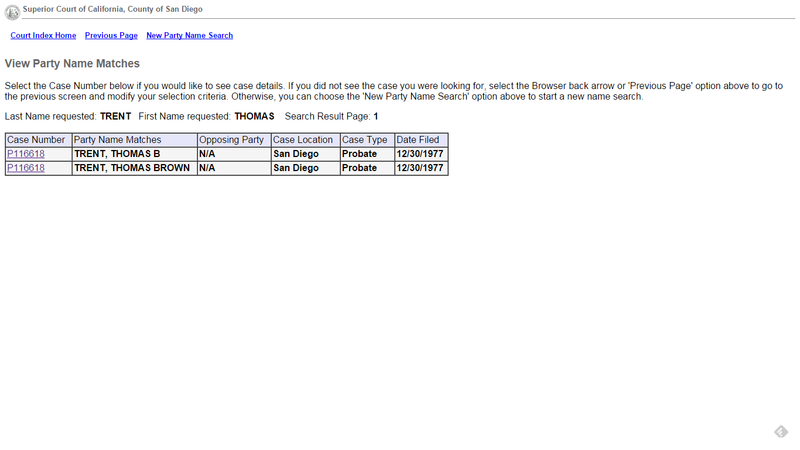 The California Death Index, 1940-1997 told me that Thomas B. Trent died on 23 December 1977 in San Diego County. I found an obituary in the San Diego Union newspaper for Thomas B. Trent that noted that he had a son and six grandchildren. The San Diego Superior Court has digitized the indexed probate records from 1974 to the present, and has images available online for files from 2008. Before 1974, the files are indexed in record books, and the actual files are on microfilm or microfiche. 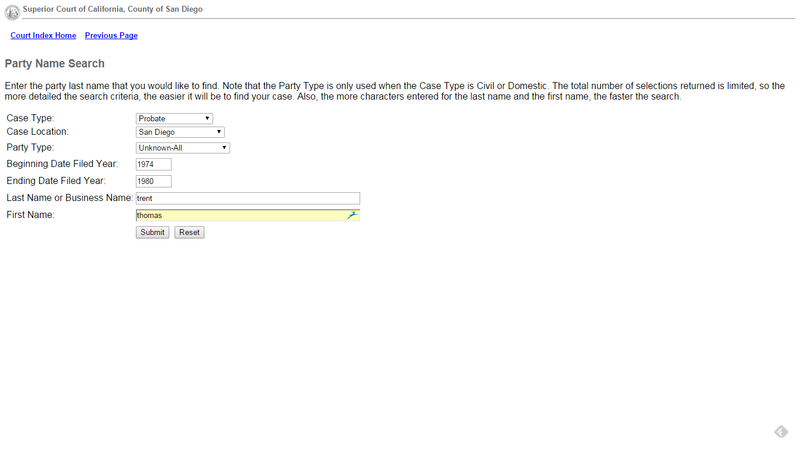 On the fields above, I entered the Case Type = "Probate," Case Location = "San Diego," Beginning Date = 1974, Ending Date = 1980, Last Name = "Trent" and First Name = "Thomas." The Probate record "In the Matter of Thomas B. Trent" was filed on 30 December 1977. It is a case with "Letters of Testament/Admin WWA." I think that means that it is an Administration file With Will Annexed (but I may be wrong!). The next issue is "how do I obtain it." The web page to "How to View a Court File" says that "The public may request and view a file by filling out the required court form and showing a valid driver's license or other valid photo I.D. which court staff will record." However, the file must be viewed at the court's business office, and cannot be removed. 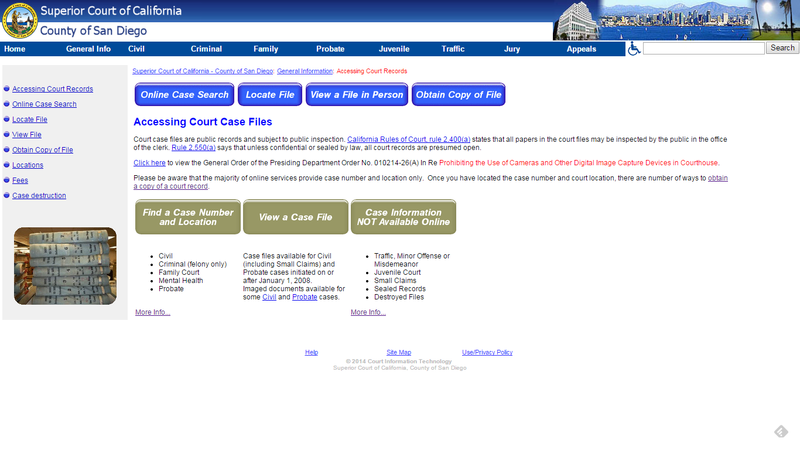 On-line when accessing imaged court records for limited case types/locations post 2011. In person at the courthouse or branch location where the record is located. By mailing a request for copies to the office where the record is located, along with appropriate fee." Go to the courthouse where the file is located. Copy requests must be made to the clerk at least 30 minutes prior to the business office closing. If you do not know the case number, you can look up the case number on the public computer at some court locations. For cases from 1880 to 1964, go to Central Records where the index is located. Provide the court staff at the counter with the case number. A picture identification card must be presented to view case files. 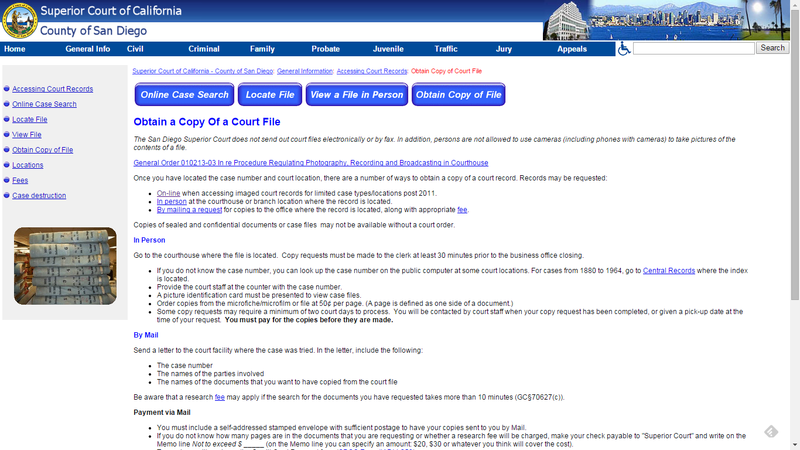 Some copy requests may require a minimum of two court days to process. You will be contacted by court staff when your copy request has been completed, or given a pick-up date at the time of your request. You must pay for the copies before they are made." 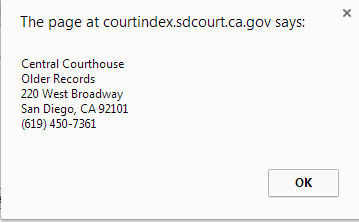 So in order to see this file, I need to go to the Central Courthouse in downtown San Diego and go to the Other Records office, which is in the Basement, and follow the directions given above. I need to check back with Rick and see if he is willing to pay the fee for me to obtain the probate file in question. It appears that the cost of obtaining the file is 50 cents per page copied, but it has to be copied by the Court personnel, and I would have to make a second trip to the courthouse to obtain it. Alternatively, Rick could save me the trip by ordering the file copies by mail, including paying the correct fee. This process interests me because my grandparents died in this same time frame and I have not searched for probate records for them, or any other San Diego ancestor or relative. Four of my great-grandparents, and three great-great-grandparents died in San Diego, as did several aunts and uncles. This may get expensive!! Have you searched for Court records in the jurisdictions where your ancestors and relatives (parents, grandparents, aunts, uncles, etc.) lived and died? Many counties have these resources available, for a price, like San Diego County above.